When Naseema woke up the day after her delivery, she panicked. 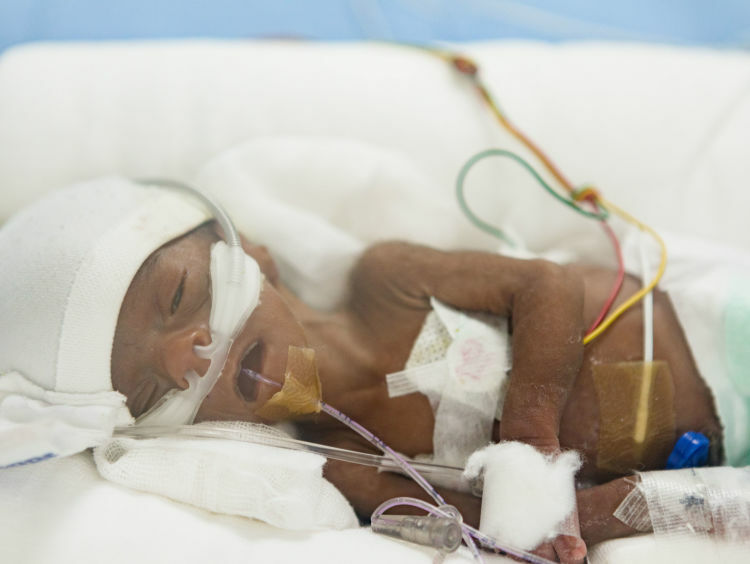 Her baby was not next to her where she is supposed to be, instead, she was in the NICU fighting for her life. Ever since they got married five years ago, all Naseema and Shaik have wanted was to start a family. Their prayers were finally answered but at a great cost. 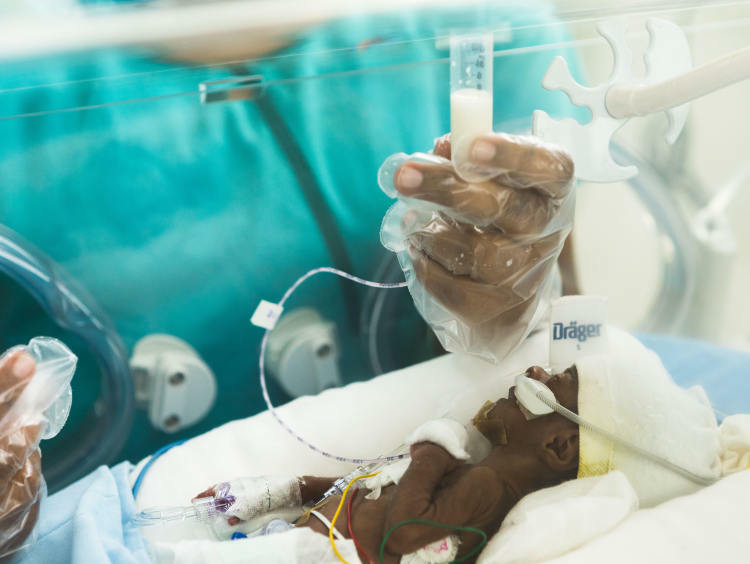 Naseema and Shaik’s baby girl’s life began in pain. 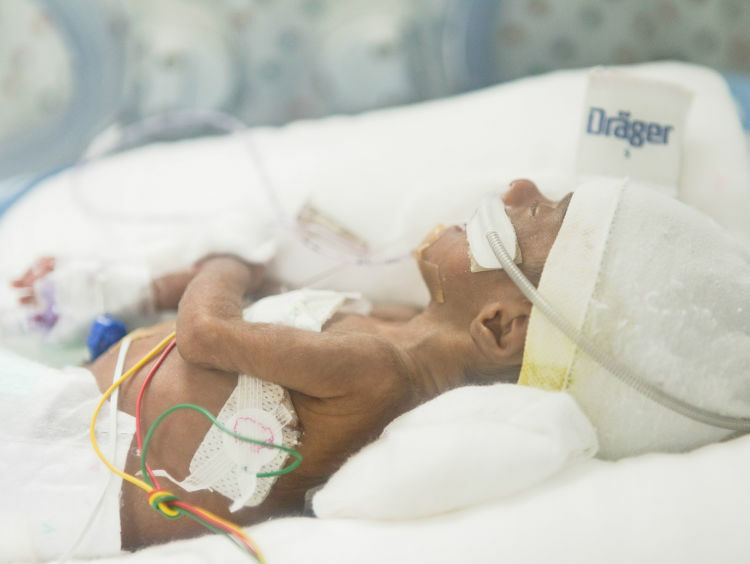 She was born premature and extremely underweight. Their baby girl has been in the NICU for nearly 20 days now and only continued treatment can save her life. 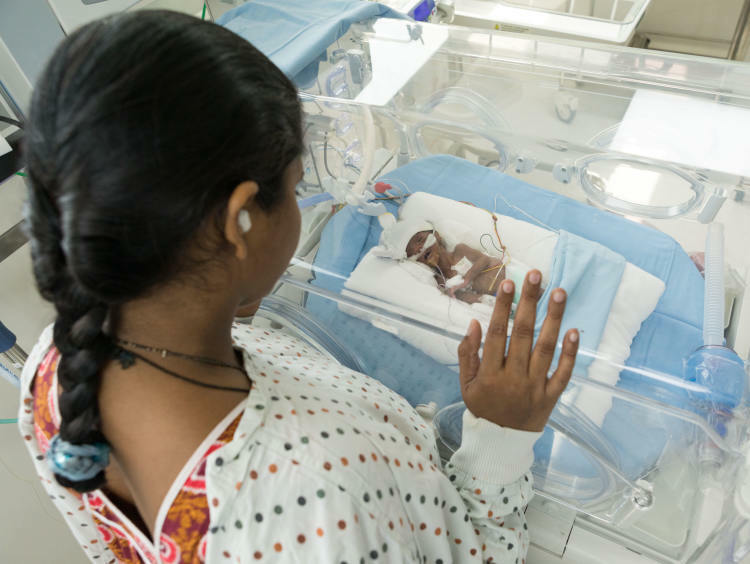 Naseema’s baby girl’s organs were underdeveloped when she was born. She’s been on oxygen support ever since, but her condition is improving. She’s increasing around 7 gms every day, and her organs have started developing. 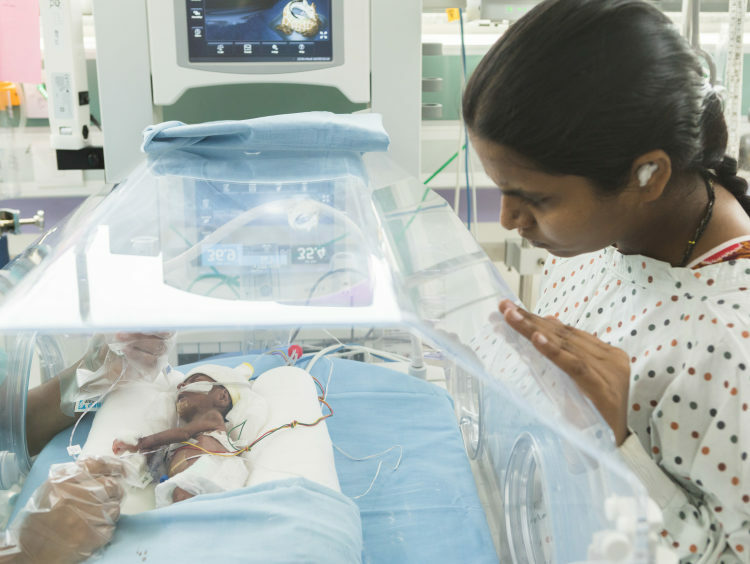 However, their baby girl needs to stay in the NICU for at least 6 more weeks to get stronger and reach her ideal, healthy weight of 1.5 kg. Their baby girl was born in the seventh month of pregnancy after Naseema’s blood pressure shot up. Delaying the delivery would have put the mother and child at risk. 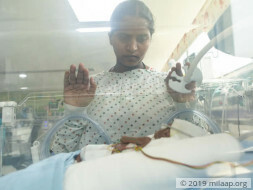 It was their baby girl’s only chance to survive, and ever since, she has fought bravely. Her little improvements every day make her parents and doctors happy, but only continued treatment can put her completely out of danger. Now, Shaik works hard all day to try and continue treatment, but he's struggling. So far, Shaik and Naseema have spent nearly 6 lakhs on their baby’s treatment after taking several loans. Her daily medical expenses are 35,000 and Shaik’s income from a private company isn’t enough for him to continue her treatment for another 6 weeks. Naseema and Shaik’s baby girl is a fighter and has made it this far, now she needs your help to complete the last leg of her treatment and finally go home. This is her only chance to survive. Your support will save Naseema and Shaik's baby girl. Baby girl of Naseema could not make it and passed away. She was severely pre-matured and she had a cardiac arrest, doctors tried their best but could not revive her. The parents are devastated. We thank you for the support which you have shown towards the little one. The funds raised from this campaign will be utilised towards the baby's treatment so far. Thank you for the wonderful support that you have shown towards my daughter. She is doing better now compared to earlier and her health has improved considerably. Her dependency on the ventilator and the oxygen support has reduced a lot. 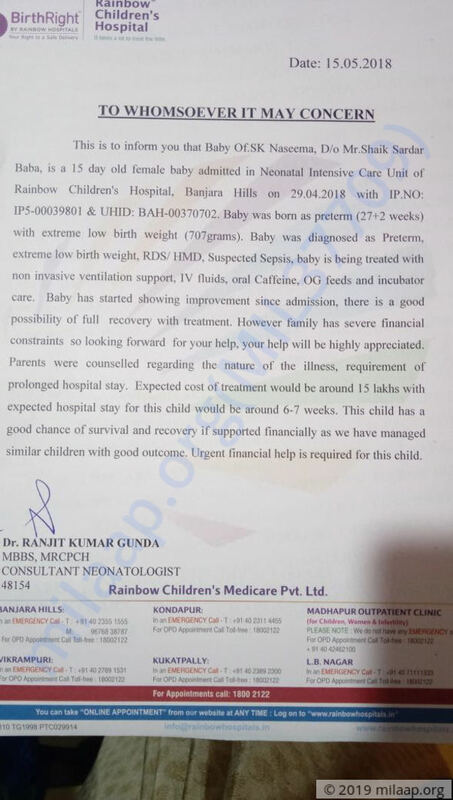 The doctors suggest that they will be keeping her under observation for about another month to avoid infections and help her in recovering faster. I would like to thank you all once again. Please do pray for her health and speedy recovery. Do share this campaign further with your friends and family. Will keep you posted.